At the Fall AGU 2013, I presented a summary of work done by Emma Gleeman (Brown) and Sarah Zibart (Western Kentucky University) along with Amanda Clarke (ASU) and Fabrizio Alfano (ASU) as part of the Research Experience for Undergraduates: Landscape evolution in a monogenetic volcanic field led by Nancy Riggs at NAU and supported by the US National Science Foundation. 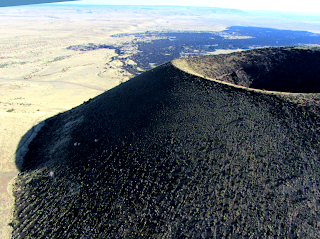 Among other things, we used the 2D non linear diffusion code developed by Mattia de’ Michieli Vitturi (de’ Michieli Vitturi and Arrowsmith, Two-dimensional nonlinear diffusive numerical simulation of geomorphic modifications to cinder cones, Earth Surf. Process. Landforms (2013) and built on our good collaborations with Mattia.